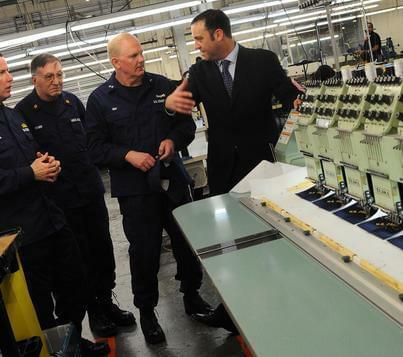 Newark, N.J. – Mitch Cahn (right), President of Unionwear, provides a tour of his Newark, N.J., ball cap manufacturing facility to Coast Guard Capt. Robert R. Mckenna, Commander of Community Services Command, Bernard Reiner, a Coast Guard Auxiliary congressional liaison officer, Rear Adm. Daniel R. May, Commander of Personal Service Center, Wednesday, Dec. 14, 2011. 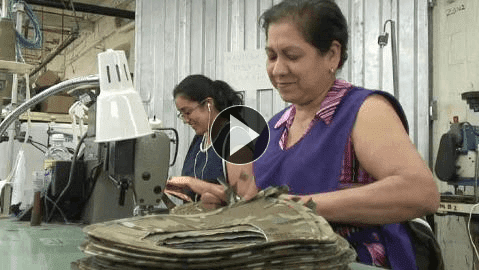 The Coast Guard presented Unionwear a Certificate of Appreciation for their outstanding efforts, providing on-time delivery of the Coast Guard’s new standard uniform ball cap.